Status: Common regular spring migrant east and central, uncommon west. Common regular breeder east and central, rare west. Common regular fall migrant east and central, rare west. Hybrid zone between Baltimore and Bullock’s orioles shown in the area with cross-hatching with pure Baltimore Orioles occurring in central and eastern Nebraska east of the dashed line. Documentation: Specimen: UNSM ZM7017, 30 Nov 1900 Lancaster Co.
Hybridization occurs between this species and Bullock’s Oriole; see Bullock’s Oriole account. Following the report of a Scott’s Oriole in 2006 (see that species), several observers noted sightings of yellow Baltimore Orioles, including photos. It appears that orange pigments are diet-derived (Thomas et al 2014), and some orioles reaching our area may have experienced a deficiency of food items that produce orange coloration. This species arrives in late Apr, although there are several earlier older reports from mid-Apr; the above dates are from the last 10 years. In the Panhandle, where migrants are uncommon, arrival is in mid-May. A banding station in Elkhorn, Douglas Co reported large numbers of Baltimore Orioles passing through in the years 2002-2015; yearly totals ranged from 49 to 526 (David Stage, personal communication). During the peak year, 2014, of 526 birds banded, 113 were recaptures from previous years, and 413 were new captures (Dave Stage, personal communication). A banding/recapture study in a Hall Co yard in 2014 and 2015 included an estimated 143 birds present 2 Jun 2014, and 164 during 14 May-15 Jun 2015 (Lingle 2015). The observer noted a maximum count at any one time of only seven (Lingle 2015). These studies show that counts of observed number of birds may greatly under-estimate the actual number of individuals present in an area unless an advanced methodology (e.g. mark/recapture protocol) is used. High counts: 154 in Hall Co 11 May 2002, 148 there 13 May 2006, 124 in Sarpy Co 13 May 1995, and 70 at a feeding station in Hall Co 29 May 2016. 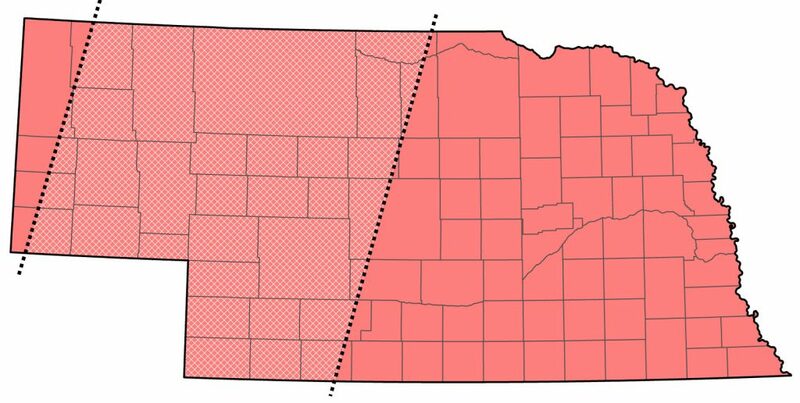 Summer:This species breeds commonly throughout Nebraska, except for the Panhandle, where it is rare. Mollhoff (2016) showed few confirmed reports of nesting in each atlas period (1984-1989 and 2006-2011) in the Panhandle; the five reports were in Sheridan, Scotts Bluff, Morrill, Garden, and Deuel Cos. There were three reports in 2018 from the Pine Ridge in Sioux and Dawes Cos; singles at Fort Robinson, Dawes Co 2 Jun and 9 Jul, and at Sowbelly Canyon, Sioux Co 2 Jun. There was little change in distribution between the two breeding bird atlas periods (Mollhoff 2016). It is apparent that this species has spread westward since 1900, possibly at the expense of Bullock’s Oriole. According to Bates (1900), Bullock’s Oriole was “very common at Long Pine” in Brown Co; Bates did not list Baltimore Oriole at that location. Bruner et al (1904) stated that at the end of the 19th century Baltimore Oriole occurred west only to central Nebraska. BBS trend analysis shows that this oriole has increased annually 0.27% (95% C.I. ; -0.40, 0.92) 1966-2015 (Sauer et al 2017); near Crook, Colorado, between the 1950s and 1970s, the percentage of Baltimore Orioles increased while the percentage of intergrades and Bullock’s Orioles decreased (Corbin et al 1979). There is a specimen, UNSM ZM7012, taken at Scottsbluff, Scotts Bluff Co 28 Jun 1916. Movement out of the north and west begins in Aug, and departure from the state is essentially completed by late Sep. This species has a propensity to linger late in fall and into early winter in the east; latest date is 14 Jan, but overwintering has not been documented. There are nine reports for Nov, and these later reports: one in Bellevue, Sarpy Co 1 Dec 1974 (Williams 1975), a male in a Bellevue yard 8 Nov-12 Dec 1981 feeding on fallen apples (Cortelyou 1982), one surviving on peanuts at an Omaha, Douglas Co feeder until 11 Dec 2001, one at a Sarpy Co feeder from 30 Nov 1979 through December (Williams 1980a, 1980b), and one which had been present in Cass Co since 1 Dec 1986 was caught by a cat 14 Jan 1987 (Williams 1987). One that was first noted at a feeder in Seward on the Seward-Branched Oak Lake CBC 14 Dec 2014 was photographed there two days later and reappeared 10 Jan; it was aged as a first fall individual. There are several fall reports from the Panhandle; latest dates are 18 Sep 2010 West Lawn Cemetery, Gering, Scotts Bluff Co, and a late male was at a Scottsbluff feeder “through Christmas” (Cortelyou 1972). High counts: 51 at one location in Lancaster Co 17 Aug 2009, 20 near Gibbon, Buffalo Co 30 Aug 2003, and 19 at Lange WPA, Clay Co 20 Aug 2000. Photograph (top) of a Baltimore Oriole in Papillion, Sarpy Co 4 May 2008 by Phil Swanson. Bates, J.M. 1900. Additional notes and observations on the birds of northern Nebraska. Proceedings of Nebraska Ornithologists’ Union 1: 15-18. Corbin, K.W., C.G. Sibley, and A. Ferguson. 1979. Genetic changes associated with the establishment of sympatry in orioles of the genus Icterus. Evolution 33: 624-633. Cortelyou, R.G. 1972. 1971 Christmas Count. NBR 40: 15-21. Cortelyou, R.G. 1982. 1981 (Twenty-fourth) Fall Occurrence Report. NBR 50: 3-20. Lingle, G.R. 2015. Oriole Consumption of grape jelly. NBR 83: 93-97. Williams, F. 1975. Southern Great Plains Region. American Birds 29: 707-711. Williams, F. 1980a. Southern Great Plains Region. American Birds 34: 176-179. Williams, F. 1980b. Southern Great Plains Region. American Birds 34: 286-288.